Francesca completed her piano studies at the Cherubini Conservatory in her native Florence, first under the guidance of Guglielmo Rosati and then under Giancarlo Cardini. She graduated with honors. During that time, she studied composing with Pierluigi Zangelmi, Bruno Rigazzi and Romano Pezzati. After receiving her diploma, she became a student of both Daniel Rivera and Alessandro Specchi and also attended specialization courses with Vincenzo Vitale, Konstantin Bogino, Dario de Rosa, Maureen Jones, Angelo Faja, Vinko Globokar, and Elio Battaglia. In addition, she studied the harpsichord under the guidance of Annaberta Conti. She was the winner of piano competitions in Velletri (1985) and in Albenga (1987) and was also a winner of the Schubert chamber music competition (1993). Since her years at the conservatory, she has devoted much of her time to chamber music (instrumental and with singers). These experiences led to performances all over Italy and abroad, allowing her to create a vast repertory ranging from Renaissance to contemporary music. She has participated in important exhibitions (Biennale Musica, Venice, Settembre Musica, Florence, Amici della Musica, Milazzo, S. Sepolcro, Cortona, Estate Fiesolana, Mattinate Musicali at Verdi Theatre in Pisa, Festival of Santafiora) and collaborated with lead singers and directors (including Daniele Damiano, principal woodwind of Berliner Philarmoniker; Libero Lanzilotta, principal double-bass of Santa Cecilia; Virginia Ceri, strength behind some of the most important Italian and European orchestras; and many others). 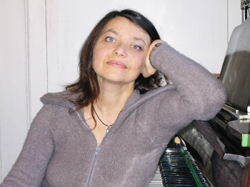 Francesca collaborated as a piano accompanist in various vocal chamber music specialization courses held by Liliana Poli, ranging from James Griffet of Pro Cantione Antiqua on technique and interpretation for singers and on the vocalità from the Renaissance to the Baroque, to Aldo Reggioli on opera music. She was an accompanist and “trainer” at the Spoleto Ars Symposia (teachers Judith Cohen, Brian Jahulinen, Enza Ferrari). She recorded with Chandos and several times with RAI Italian television stations. She is a tenured complementary piano teacher at the “Perosi” Conservatory in Campobasso, and ISTITUTO EUROPEO Music Department.